This past weekend, Celt-X competed at the first robotics expo at the CNE. Teams from around the province gathered to showcase their robots and to amaze the crowds with the amazing creations of high school students. With Friday being a working day for most people, we opted to only attend the Saturday and Sunday parts of the competition. This event marked the first time some of our students had ever taken the train – it was definitely a memorable start the competition. With a 9:30AM start, everyone was much more rested than for our normal events that see people waking up before 6AM. 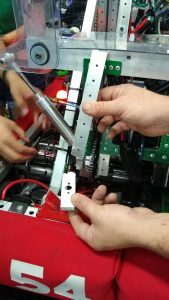 On Saturday, our alliance was able to pull out some great wins, and was the first pick of Team 865. Together with 6070, we took on the competition to sweep the playoffs and take home the win for day 2. Sunday started off with us earning an award for our auto. We got a chance to meet with Dave Robitaille from IBM (one of our sponsors) as well as to present some Siemens representatives with thank you plaques for their support this past season. Our robot went on to win the organizers exhibition match, putting on more cubes in auto than the other alliance managed in teleop. A testament to why we let our students drive the robots and not the mentors. Unfortunately, we also broke a wheel in that match. The rest of the day provided a few opportunities for our pit crew to get in a little work – fixing a broken intake and replacing a wheel. Despite the issues, we once again made it to playoffs, and ended the 3rd day as finalists. The CNE provided an excellent opportunity for FRC teams to showcase their robots to people who would not normally be in attendance at Robotics competitions. Hopefully we were able to inspire a few new people with our passion for all things robots. That must have been super exciting! A total blast! Our team can’t wait for next year.